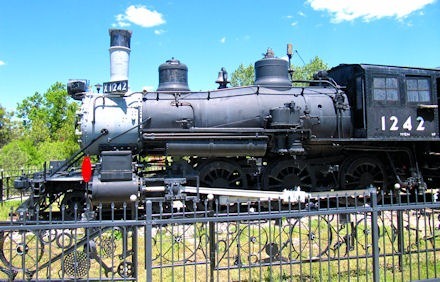 Two railroad relics rest in Cheyenne parks commemorating the importance railroads have played since Cheyenne’s founding. The massive Big Boy steam engine #4004 proudly stands in Holliday Park. The coal-fired Big Boy was designed to pull a 3600-ton train over the steep Union Pacific grads between Cheyenne and Ogden, Utah. Ranked as the world’s largest steam locomotive, Engine #4004 ran from 1941 – 1958 and is one of only eight remaining Big Boys on display in the United States. 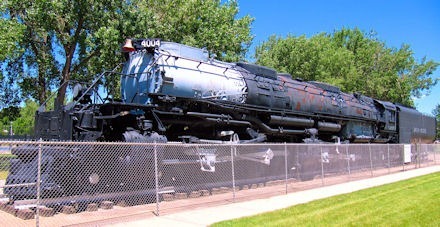 Wyoming’s oldest locomotive is retired to Lions Park on the north end of Cheyenne Botanic Gardens. 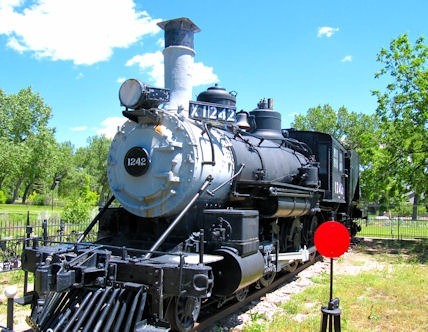 Nicknamed “Ol’ Sadie” by Union Pacific crews, #1242 was built in 1890 in New Jersey. The coal/steam powdered engine ran the Walcott-Saratoga-Encampment spur line until 1954. While visiting “Ol’ Sadie” note the unique fence created by Floyd Young, the last engineer to operate the locomotive. In retirement Young collected Western and railroad relics, forming them into a fence around his home. After his death the family donated the fence to the Botanic Gardens to enclose Young’s beloved #1242. Eight-foot-tall cowboy boots dot the Cheyenne landscape. 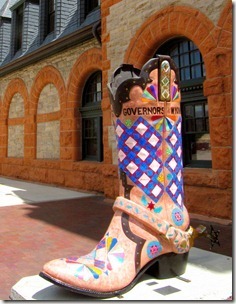 Created as a fundraiser for the Cheyenne Depot Museum Foundation in 2004, 19 boots were painted and decorated by local artists. Sponsorships and auction made nearly $100,000 for the museum. 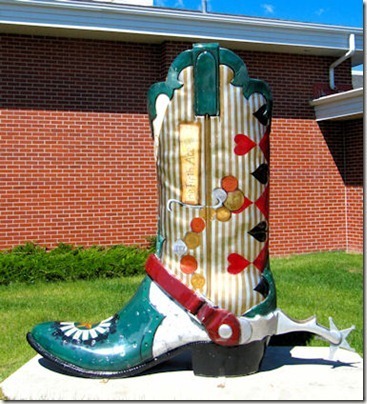 The boots are displayed throughout the community – parks, businesses, and public spaces to the local community college. The project’s theme was “If this book could talk, what story would it tell?” Governors of Wyoming and Where the Deer and the Antelope Play appear fairly obvious. A free audio tour relates the story of each book in the artists’ own words. Simple to use, the tour is accessed by calling 307-316-0067 followed by an assigned boot number and the pound key. While the tour is free individual cell plan charges may apply. Of the boots we visited my favorite was Licensed to Boot installed outside of the Wyoming State Museum. 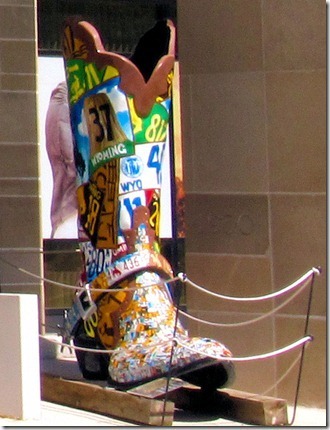 The top part of the boot is painted with scenes from past Wyoming state license plates. The toe of the boot is cover with a mosaic of pieces cut from actual license plates donated to the project. Upon investigation I discovered Licensed to Boot was an after school project of the Carey Junior High Art Club. A shout out to the students for their creative and accomplished Big Boot! A free “These Boots are made for Talking!” brochure is available at the Cheyenne Visitor Information Center in the Depot. The world’s largest outdoor rodeo and Western celebration captures Cheyenne’s essence each July. For 10 days there’s nothing quite like “The Daddy of ‘em All”. 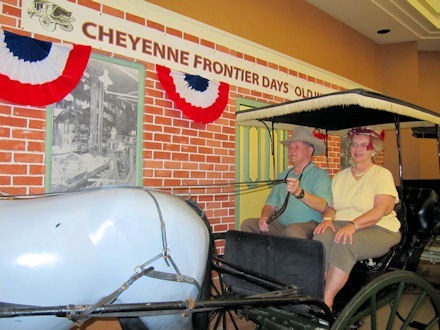 Year round, Cheyenne’s visitors can capture that Western tradition and spirit with a stop at the Cheyenne Frontier Days Old West Museum & Store. 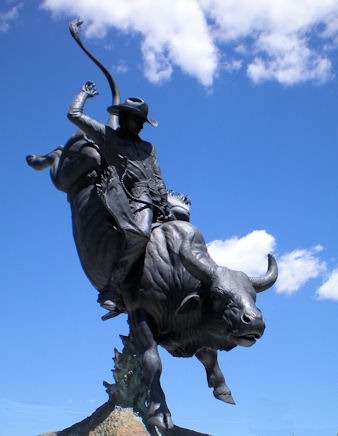 Permanent and changing exhibits demonstrate the multiple facets of the world famous event, saddle bronc riding to championship belt buckles, grand parades to rodeo queens. A current exhibit, “Bullfighters: The Risky Road to Glory!”, features not only the daring and determined bull riders but also the important role of rodeo clowns and legendary careers of Mr. T and Crooked Nose – bulls rarely successfully ridden. 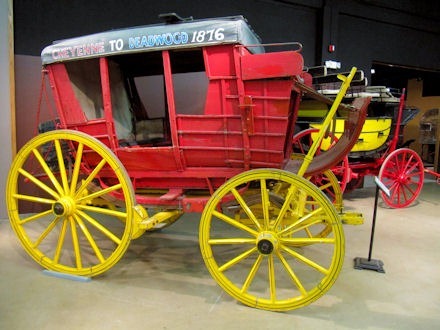 The museum houses a historic collection of horse-drawn carriages and wagons, many that make appearances in the Frontier Days parades. Visitors can climb aboard one designated carriage for a photo op complete with a “becoming” hat. “Hole in the Wall” is an interactive gallery giving kids an opportunity to practice roping and Western themed activities. Shoppers find a plethora of Cheyenne Frontier Days branded merchandise in the Old West Museum store. Need a souvenir belt buckle, t-shirt or etched martini glass? You’ll find it here. When You Go: The museum located at Frontier Park is open year round except major holidays, 9am-5pm weekdays, 10am-5pm weekends. Admission is $7/adult with children 12 and under free. 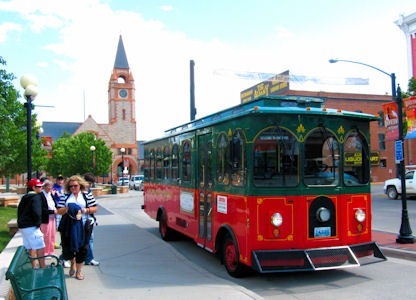 On our first afternoon in Cheyenne we hop aboard the bright red and green Cheyenne Street Railway Trolley, an easy and relaxing intro to the city’s history and attractions. As our driver/guide Ron spins stories of a colorful past I make a list of locations I want to revisit, either to explore or take photographs. As we pass the century-old Plains Hotel Ron explains the reasoning behind the smaller-than-average elevator. In the early 1900s when cowboys came to town to let off a little steam they would frequently ride their horses into bars and hotels. The Plains Hotel owner wanted an elevator that would hold only four men at a time – too small for a horse, effectively keeping horses out of the guest rooms. Later when we stopped by the Plains Hotel we watched four adults squeeze into the elevator that still keeps horses at bay. 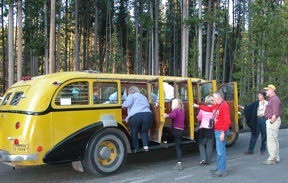 The 90-minute trolley tours run daily from early May through September. For those wanting a car-free day passengers can stop at several attractions and join the next tour in 90 minutes. Weekday stops include The Nelson Museum of the West, the Wyoming State Capitol and Museum, the Frontier Days Old West Museum and Cheyenne Botanic Gardens, and the Historic Governor’s Mansion. Check the website for tour times and weekend tour details. Tours cost $10/adult and $5/children 2-12. The Trolley Plus pass valid for two days includes admission to the Old West Museum, Nelson Museum and the Depot Museum, plus the trolley tour all for $15/adult. Halloween Ghost Tours and Christmas Light Tours offered yearly. We made the info center in the restored Cheyenne Depot a first stop on our discovery trip to Wyoming’s capital city. Well stocked with printed info for all tourism interests, the selection covers all of the state not just Cheyenne. Staff gladly answers questions, offers suggestions and gives directions. 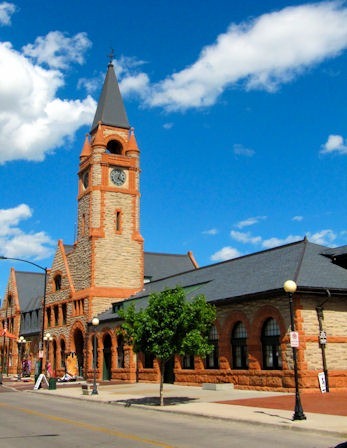 Purchase tickets for the Cheyenne Street Railway Trolley tours. Or, pick up the free booklet for the Historic Downtown Cheyenne Walking Tour which covers 55 buildings along a 23-block stroll through the core of the city. The information desk is open 8am-5pm Monday – Friday, open weekends with varying seasonal hours. Hoeninghausen offers the following suggestions for ensuring a great family trip. Carefully choose the time you travel. If you have very young children or a flexible travel schedule, consider traveling during the shoulder seasons of spring and fall. 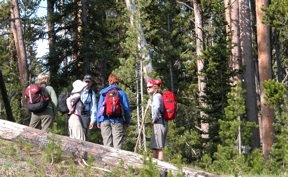 These seasons offer a greater choice of accommodations and campground sites. 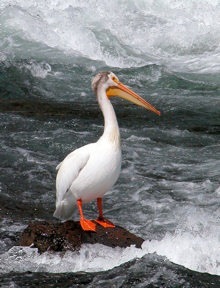 Plus there is the added bonus of the best wildlife-viewing opportunities. 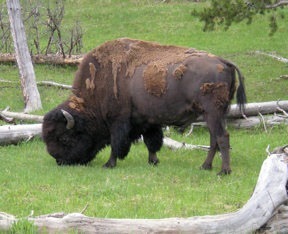 Spring is the time to view bison and elk calves and fall is the mating season for bison and elk. Study the park before you go. 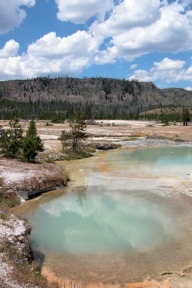 Xanterra offers a Yellowstone Adventure Planner through its online gift store. Priced at $39.95, the planner comes with a DVD highlighting the park, park map, copy of the Yellowstone National Park Magazine, guide to activities and picnic spots, safety and photography tips and coupons for more than $40 that can be used for gifts and activities. 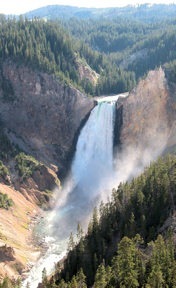 Another source is the National Park Service (NPS) site, which also offers a variety of online vacation planning tools. Learning about the park together also gives family members a chance to discuss their expectations. After learning a bit about the park, ask each member what they’d like to do and see? Older teens may want to take a challenging hike while younger kids may want to see a mudpot. Decide where to stay in the park. 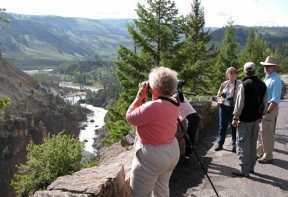 Yellowstone is highlighted by a huge diversity of geological features, including hot springs, geysers , Yellowstone Lake, the Grand Canyon of the Yellowstone and Lamar Valley, considered the best wildlife-watching region in the lower 48 states. 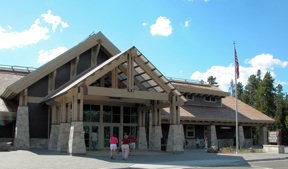 Yellowstone’s nine lodges are located throughout the park. Xanterra recommends studying a map to help decide which location – or locations – makes the most sense. Some people prefer to change hotels every night as they move around the park; others prefer to establish one lodge as a home base and then return to the same lodge each night. Lodging reservations can be made at online or by calling (1) 307-344-7311 or toll-free (1) 866-GEYSERLAND (1-866-439-7375) Ask reservations sales agents for their suggestions and guidance when booking lodges and activities. Let every family member pick at least one activity. 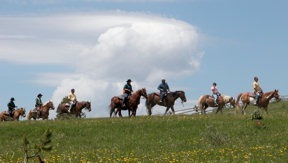 There are numerous activity choices that are perfect for every age group. For example, little ones might enjoy the covered wagon ride to the Roosevelt Cookout. 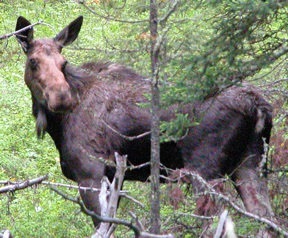 Another family member might want to participate in a ranger-led hike. Concessioner Xanterra offers an online adventure planning tool that allows travelers to choose activities based on the duration of the adventure, intensity level and region of the park. Book your lodge(s) now. 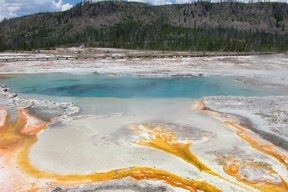 Yellowstone National Park features nine lodges in a variety of locations throughout the park. 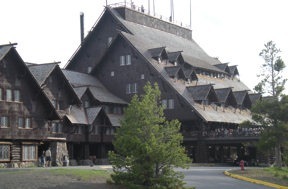 Some of the historic or most popular lodges – the Old Faithful Inn and Old Faithful Snow Lodge – are beginning to fill for prime summer dates. 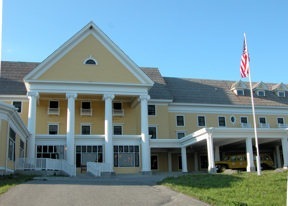 Still, with some 2,000 guest rooms in the entire park, there are plenty of rooms available for the summer. Lodging reservations can be cancelled with full refunds on deposits if made 48 hours or more before the arrival date. Pack smart. Yellowstone is one of the wildest spots in the country, and the weather is no exception. Pack for rain and widely fluctuating temperatures. Typical summer temperatures range from the high 70s to the low 40s. Sturdy shoes, sunscreen, hats and refillable water bottles should be included on every packing list. Get to know the National Park Service rangers. 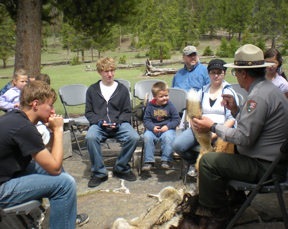 Free ranger-led programs are offered daily in every area of the park. The p rograms are fun, creative and available for families with children of all ages. For example, the Yellowstone Wildlife Olympics, a four-hour program offered six times during the summer, gives budding wildlife scientists a chance to show off their knowledge of the park’s non-human residents. The Junior Ranger program is a perfect way to engage children. Plus, there are ranger adventure hikes, evening astronomy programs and evening talks. Don’t be too ambitious. An early-morning wildlife-watching tour in Lamar Valley followed by a ranger-led geyser hike followed by a lake cruise followed by the Roosevelt Cookout may sound like a good plan, but it’s not. And it probably would not even be doable. Driving from one part of the park to the other, especially in the middle of summer, takes time. And travelers lucky enough to encounter wildlife or other special park experiences during the drive should savor those experiences instead of worrying about making it to the next activity on time. Think beyond the burger. Xanterra offers 17 restaurant choices in the park, ranging from the quick-serve Geyser Grill at Old Faithful Snow Lodge to the elegant Lake Hotel Dining Room. 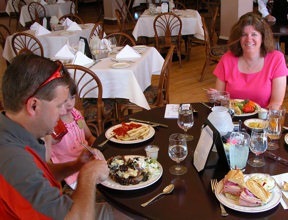 Every restaurant offers value-priced options to suit every budget, as well as vegetarian and children’s options. Be safe. Follow all posted National Park Service signs and directions. 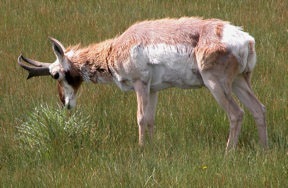 Every year, tourists stray from a boardwalk in a hot springs area or get too close to wildlife. The National Park Service medical clinics see plenty of injuries each summer that could have been prevented if travelers had simply followed NPS rules. Start your in-park visit with a trip to a National P ark Service Visitor Center. NPS rangers have the latest information on wildlife sightings, trail conditions, ranger-led programs and more. This is also where kids can obtain information on becoming a Junior Ranger. Do the dawn. Wildlife are early risers, and the best time to see them in action is just after dawn. Make the effort to get up early to improve your chances of seeing wildlife. 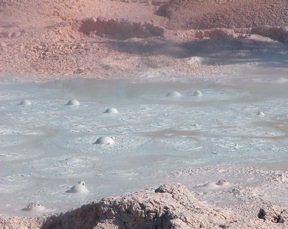 Save the geysers for mid-day when animals are less active. The other great time to see wildlife is at dusk. 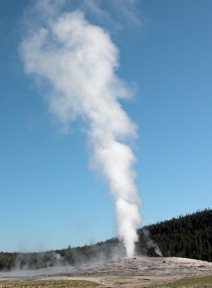 Visit Old Faithful in the late afternoon and evening. 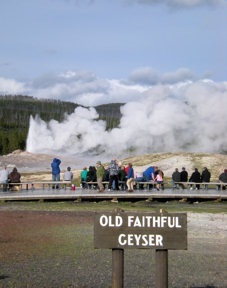 When day- trippers head back to their hotels in gateway communities, the popular spots such as Old Faithful Geyser have fewer visitors. See it in the late afternoon and you are more likely to find a place to sit and watch from the boardwalk benches. Bad night – Bob’s not feeling well. 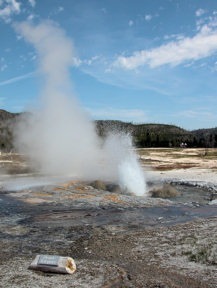 Day is cloudy – the sky’s the same color as the steam and sprayfrom the geysers and fumaroles, forecast includes rain. Breakfast at Old Faithful Inn Dining Room. Nancy snaps a few pictures, watches Old Faithful one more time and goes to the temporary visitors center – the new one is taking shape. We see a couple of bison grazing very close to the road, also a larger bison herds in meadows plus elk, a pair of nesting bald eagles and a muskrat swimming down the river. Before leaving the park we stop at the Junior Ranger Cabin near Madison Junction. Route US191 from West Yellowstone to Belgrade, goes through the extreme western portion of the park, then follows the Gallatine River for miles and miles. Route US287 from west of Three Forks to Helena – broad valley with mountains in all directions, lots of wheat fields irrigated from the wide Missouri (River). Wingate Hotel, Helena – this is a good facility and good value. No prime rib at Silver Star Steak Company tonight, no Great Northern Carousel ride, no fun!